Read our full review of the new Panasonic Lumix LX100 - a premium camera with a large sensor, electronic viewfinder, Leica lens and 4K video recording. The Panasonic Lumix LX100 is a new large sensor (Micro Four Thirds) compact camera, with a bright f/1.7 - 2.8 Leica lens equivalent to 24-75mm in 35mm terms, built in Wi-Fi, an electronic viewfinder, and 4K video recording. The camera has an RRP of £699, and will be available from the 16th of October. 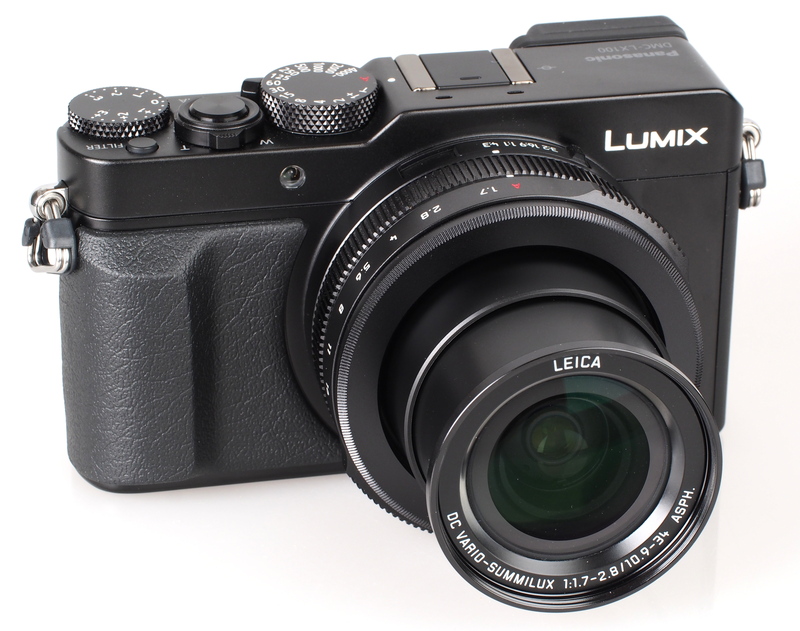 The LX100 has a new design style like the GM5, inspired by the earlier Panasonic Lumix L1 / LC1 products. The LX100 doesn't replace the LX7, which will remain on the market. 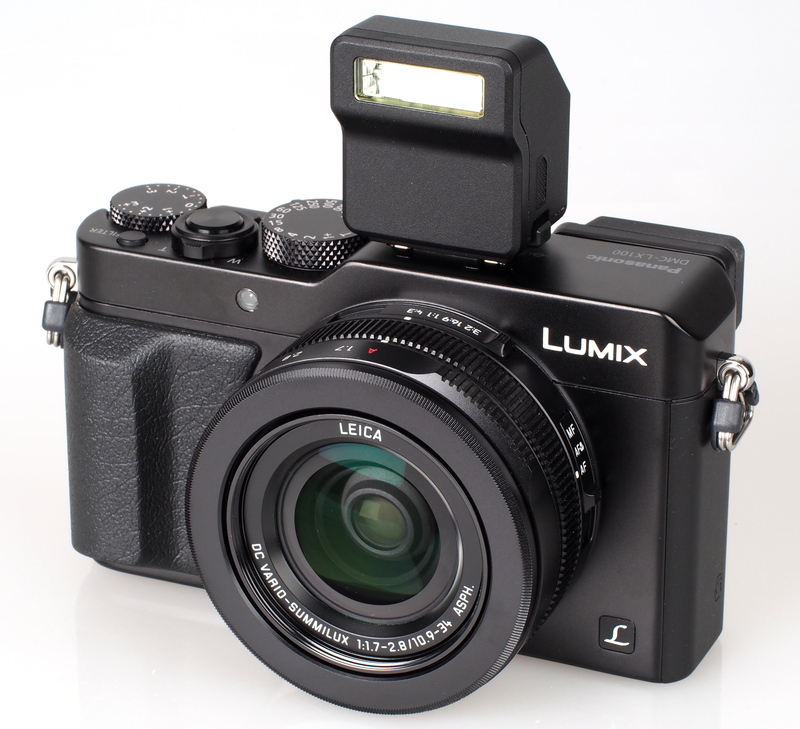 Panasonic say that the premium compact camera market or serious compact camera market is in growth, with people being interested in 4K video, built in electronic viewfinders, as well as the higher image quality on offer from cameras with a larger sensor. The Panasonic Lumix LX100 features a multi-aspect ratio sensor, offering 4:3, 3:2 and 16:9 aspect ratios with minimal image size lost and the same angle of view, and 1:1 format. 4:3 aspect ratio gives a 4112x3088 (12.5mp) pixel image, 3:2 aspect gives a 4272x2856 (12mp) image, 16:9 aspect gives a 4480x2520 (11mp) image, while 1:1 square format gives a 3088x3088 (10mp) image. The compact size of the zoom lens possible due to a more precise manufacturing process and the lens is positioned directly in front of the sensor. With 9 aperture blades it is designed to give improved bokeh / out of focus backgrounds. Under MTF testing the lens is said to give sharpness even into the corners of the image. Focus is rapid thanks to DFD (Depth From Defocus) technology from the Panasonic Lumix GH4. 4K video recording gives benefits for both improved video quality as well as photo stills shooting at 30fps. FullHD video recording quality is improved, as 4K video can be downsized and give better colour and image quality. From the 4K video it is possible to take 8 megapixel images from the footage at 30fps. The camera features built in highlight / shadow adjustment, as well as RAW editing in the camera, and gives 300 shot battery life. Manual controls on the camera body include an aperture ring, shutter speed dial, exposure compensation, aspect ratio switch, focus switch, plus a number of customisable function buttons. With numerous physical switches, controls and dials, the Panasonic Lumix LX100 is a pleasure to hold feeling good in the hand, making it enjoyable to change settings such as aperture, shutter and exposure compensation. With direct control to these settings it's easy to learn and see what changing these settings does, using either the constant preview or function button (set to preview). The front rubber grip feels good, and there is a small but effective rubber thumb grip on the rear of the camera. The metal bodied camera feels very well built with re-assuring clicks to the dials and switches. The menus are clearly laid out and will be familiar to anyone who has used other Panasonic cameras. There is a built in guide on the menu options making it easy to use the camera and change settings without having to study the manual. The Q Menu button gives quick access to common options on the rear screen, and there is access to numerous controls without having to go into the menus thanks to lots of buttons and switches on the camera. Wi-Fi Features - The Panasonic Image App is available for iOS and Android devices and has four main options letting you setup remote shooting and view photos, setup Playback on TV, send images while recording, and send images stored on the camera. To setup the connection to the smartphone you can use NFC if your smartphone has it or use a QR code displayed on the camera. Alternatively manual setup is possible. 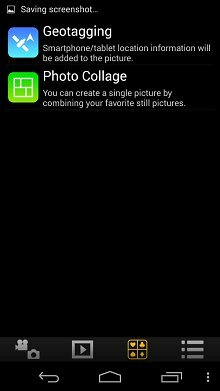 The application gives you a very good level of control over the camera, and you can start and stop video recording as well as control the camera's zoom. Battery life - Battery life is rated at 300 shots according to Panasonic / CIPA test results, or 350 shots without flash, which is good, although extended use of flash and Wi-Fi is likely to drain the battery more quickly, so a spare is recommended if you want to extend your shooting time. Focus and shutter response are both excellent, and the camera offers and impressive continuous shooting speed of nearly 12fps when shooting JPEG images, which slows to 8.6fps when shooting raw images. 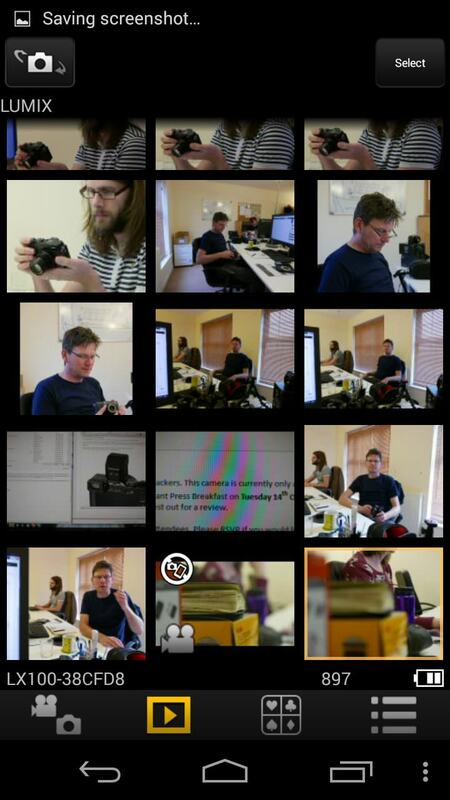 Sample Photos - The camera takes images with good colour and detail, with reliable exposure, although images can sometimes appear a little dark at times, and +0.3 exposure compensation can help brighten up images. Detail is extremely impressive at times, with fine detail captured in portrait shots, particularly with single strands of hair noticeable. Photos taken with the supplied flash show no red-eye. Lens Performance - Detail is good whether shooting at the wide-angle (24mm equivalent) end of the lens or the telephoto (70mm equivalent) end of the lens. Macro performance is good, with the camera focusing on subjects just 3cm away from the front of the lens, although for sharper results it is best to stop the lens down. Purple fringing and chromatic aberrations were extremely low, although lens flare was occasionally quite high when shooting with the sun in the frame. Some vignetting is visible when shooting wide or telephoto, and in darker areas of images it's possible to see some noise, particularly in shadow areas when viewed at 100%. Pincushion and barrel distortion are well controlled, with little visible in the JPEG images. ISO Noise Performance - For the lowest noise and best detail possible we would recommend using ISO100 to ISO800, as images have low levels of noise and good levels of detail. For lower light situations ISO1600 to ISO3200 still provides good results, although noise increases and detail is reduced, particularly at ISO3200. At ISO6400 and ISO12800 noise levels become strong and we would recommend avoiding this setting if possible, although results may still be useful if resized and used on the web. ISO25600 is best avoided as noise is at its highest, with the lowest level of detail. White Balance Performance - Auto White Balance (AWB) performs well under tungsten lighting, with the tungsten preset giving a warmer result. AWB performs very well under fluorescent lights, with the camera not offering a fluorescent preset as the auto white balance does an excellent job. Digital Filters - There are 22 filter effects are available including: Expressive, Retro, Old Days, High Key, Low Key, Sepia, Monochrome, Dynamic Monochrome, Rough Monochrome, Silky Monochrome, Impressive Art, High Dynamic, Cross Process, Toy Effect, Toy Pop, Bleach Bypass, Miniature Effect, Soft Focus, Fantasy, Star Filter, One Point Color, and Sunshine. Monochrome Filter (Ye/Or/R/G) is available in the photo style settings. Dynamic range options including iDynamic, iHDR (in iAuto mode) and HDR with the latter option combining a number of shots in camera for extended dynamic range. Video - A headline feature of this camera is 4K video recording, as there are very few digital cameras currently available that can record 4K video. 4K photo mode is an optimised recording mode for extracting 4K (8 megapixel) stills from video. AVCHD or MP4 are the video formats available, Full HD video can be recorded at 50p, 25p, and 24p, or 25p, and 24p for 4K video. The highest ISO setting available when recording 4K or FullHD video is ISO6400. Focus options include AFS, AFF, AFC, continuous AF (on/off). It's also possible to adjust highlight / shadow as well as colour options including contrast, sharpness, noise reduction, saturation and monochrome (with colour filters available). Additional video options available include iDynamic, iResolution, iZoom, Digital Zoom, Mic Level Display, Mic Level Adjust, and Wind cut. Video quality is very good with impressive levels of detail, particularly when recording 4K video. 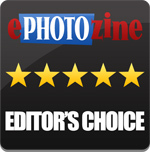 Additional example videos can be found on the ePHOTOzine YouTube channel. 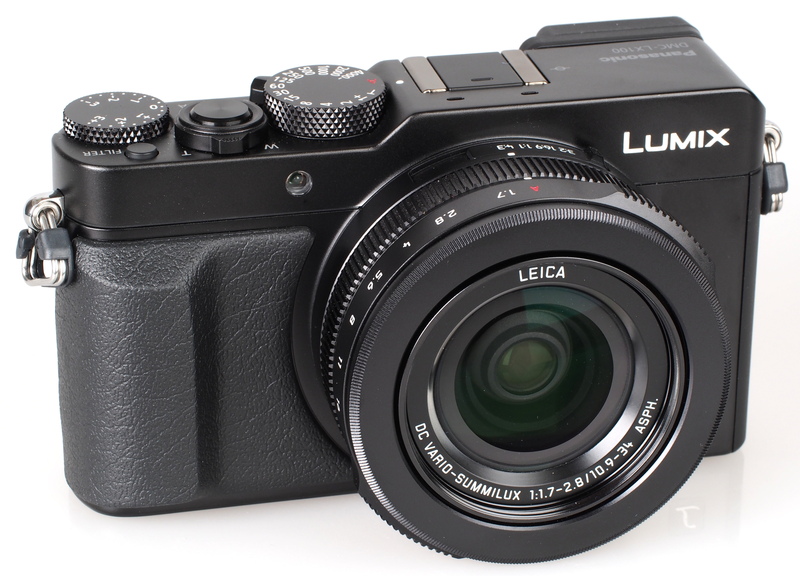 Mirrorless alternatives, such as the Panasonic Lumix GM5 (£769), are also an option letting you change lenses as well as choose what in-camera features you want, thanks to there being a variety of bodies available. However, you would need to invest in a variety of lenses to get the same aperture on offer on the LX100. The Panasonic Lumix LX100 is a serious compact camera with both a large sensor (Micro Four Thirds), and a brighter than normal f/1.7-f/2.8 Leica lens giving the equivalent of 24-75mm in 35mm terms. The LX100 offers an impressive combination of lens and sensor, without the size that would be necessary for such a bright zoom lens if you were trying to get the same with an interchangeable lens camera, in fact the lens on offer here is brighter than the typical 24-70mm equivalent lens, such as the f/2.8 Panasonic 12-35mm Micro Four Thirds lens, and considerably smaller. The LX100 is one of very few digital cameras capable of recording 4K video (with the Panasonic Lumix FZ1000 being another) and as one of the smallest currently available, this will be a big selling point of this camera. 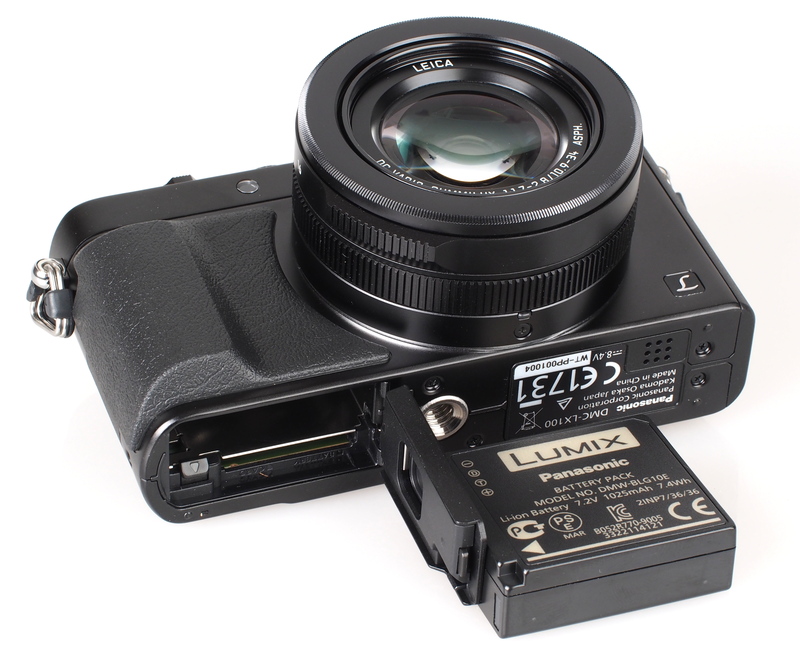 If you are looking for a "serious compact" with a large sensor, then there are no other cameras available that offer everything that the LX100 offers, for example, you can choose an alternative with a large 1.5inch sensor such as the Canon Powershot G1 X MKII, but this doesn't feature 4K video or an EVF built in. Another option would be the smaller Sony Cyber-shot RX100 III with built in EVF, however, this doesn't feature 4K video recording, nor the dedicated external aperture and shutter dials. 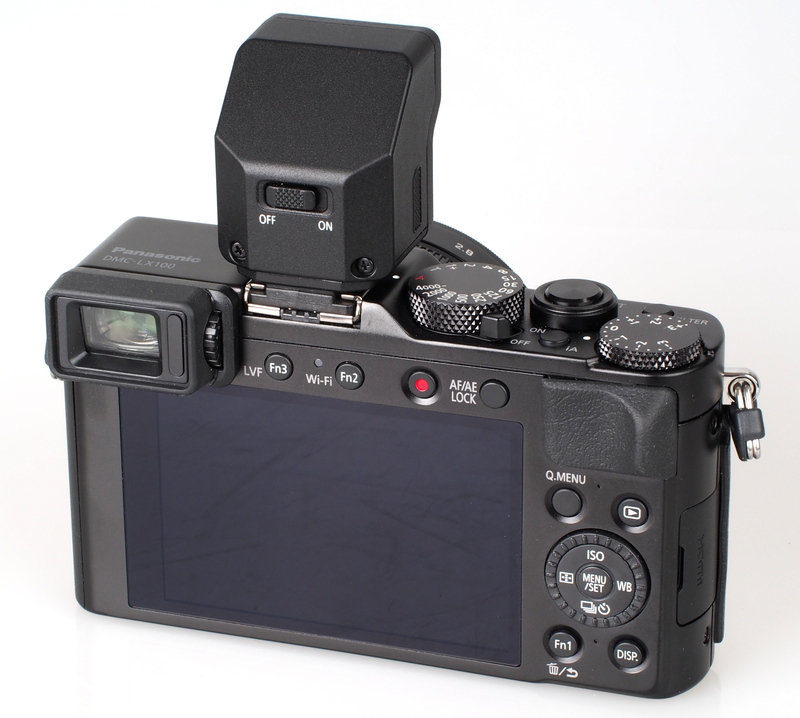 A camera with the external controls of the LX100 would be the Fujifilm X100T/s, although this features a fixed lens without the optical zoom, or 4K video. The Panasonic Lumix LX100 gives good noise performance, with good results up to ISO1600, and the camera is capable of resolving excellent levels of detail, producing very good images. The Panasonic Lumix LX100 offers an impressive range of features including 4K video recording, a bright f/1.7-2.8 Leica lens, great external controls, and packs it all into a stylish and good to use metal body, making the LX100 our Editor's Choice! The Panasonic Lumix LX100 offers an impressive range of features in a stylish metal body with great controls and design. Looks like an amazing compact! & Exp.Comp., with dedicated ISO button.......& a Hi-Res EVF !!! A compact without a built in flash... no thanks! having a separate little flash that you have to remember to bring along everywhere is a pain!! hopefully next iteration has flash built in! Great, but it is done through cropping the sensor down to 12.8 megapixels, which I don't have problem with, just sayin'. [quote]Oooooo....that looks mouthwatering ! !.....love the 'old-school' controls of Aperture, Shutter speed, & Exp.Comp., with dedicated ISO button.......& a Hi-Res EVF !!! The lens shows 10.9-34, so presumably it's a 22-68mm in 35mm terms ?? (2x factor ?) Look forward to the full EPZ review...........[/quote] I think it's more like a 2.2 crop because of the multi-aspect ratio meaning the full sensor area is never used. The lens I believe actually starts at a 'real' [in 35mm terms] 10.9mm. Looks like a fabulous little camera - Panasonic are really doing some interesting things at present. 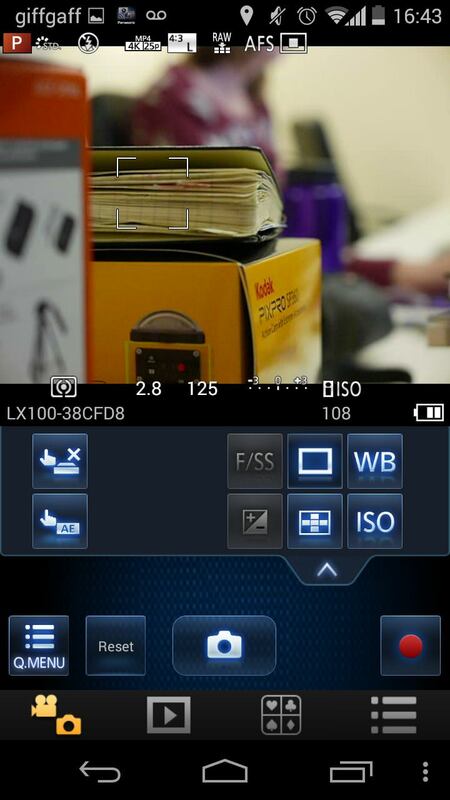 I think it's more like a 2.2 crop because of the multi-aspect ratio meaning the full sensor area is never used. The lens I believe actually starts at a 'real' [in 35mm terms] 10.9mm. Looks like a fabulous little camera - Panasonic are really doing some interesting things at present. 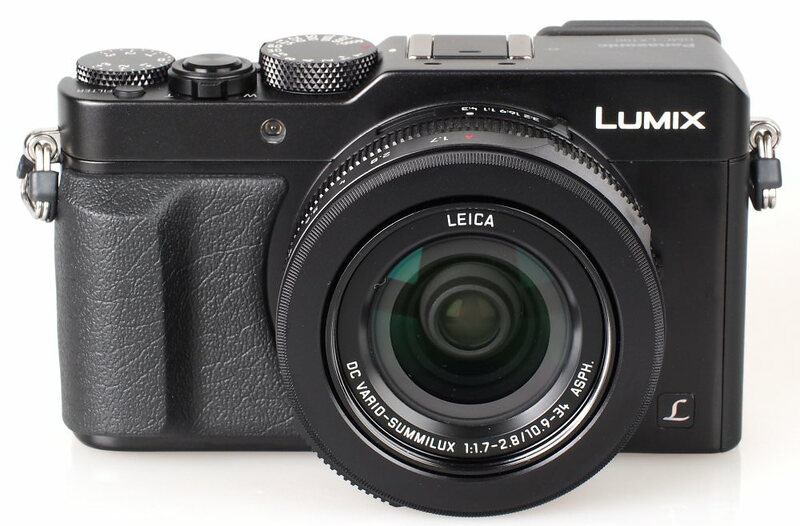 In the review on DPReview.com ([link=http://www.dpreview.com/previews/panasonic-lumix-dmc-lx100/5]link here[/link]) Panasonic are described as 'hitting one out of the park' with this camera. It might just tempt me to replace my much-loved LX5. The EVF alone would tempt me! Time to save some pennies methinks. 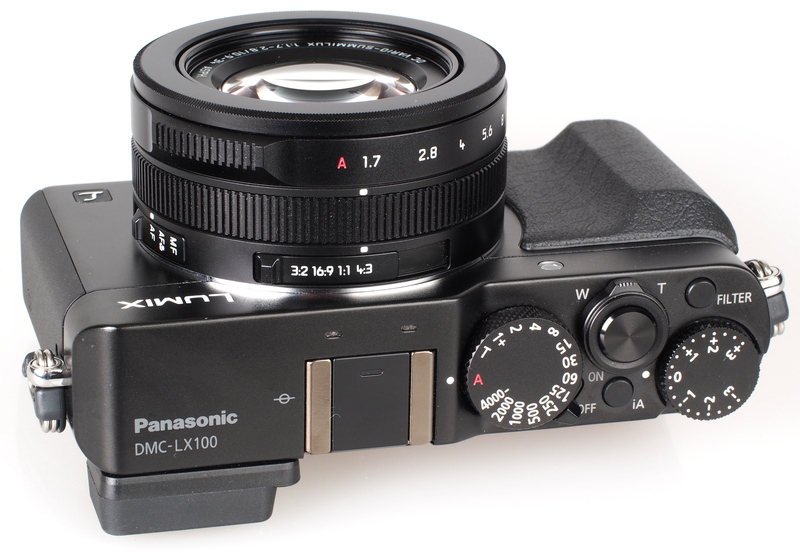 In the review on DPReview.com ( link here ) Panasonic are described as 'hitting one out of the park' with this camera. It might just tempt me to replace my much-loved LX5. The EVF alone would tempt me! Time to save some pennies methinks. I was thinking I didn't need this camera - I've got a GM1, EM1, GH3 and a few more MFT bodies I really need to sell on. But 24-75 equ. f1.7-2.8 Leica lens in a really compact package... damn you Panasonic, this has got me tempted. ...or potentially even the Leica version - is the Leica processing, the 3 year warranty and latest version of Lightroom worth £130? Any chance of a comparative review? The difference doesn't seem the usual exorbitant mark-up. I was thinking I didn't need this camera - I've got a GM1, EM1, GH3 and a few more MFT bodies I really need to sell on. But 24-75 equ. f1.7-2.8 Leica lens in a really compact package... damn you Panasonic, this has got me tempted. ...or potentially even the Leica version - is the Leica processing, the 3 year warranty and latest version of Lightroom worth £130? Any chance of a comparative review? The difference doesn't seem the usual exorbitant mark-up. It does seem like a very nice camera, but I read this has a 16 mega pixel sensor so unless you are needing to constantly change aspect ratios (Some people do), your loosing 4 mega pixels. Plus it looks like they are cropping the sensor so can they really claim it's 'Four Thirds'? [quote]The difference doesn't seem the usual exorbitant mark-up. [/quote] I said the same about the Leica version of the FZ1000 recently. No images from that for comparison either, though. Quote:The difference doesn't seem the usual exorbitant mark-up. I said the same about the Leica version of the FZ1000 recently. No images from that for comparison either, though. [quote]Plus it looks like they are cropping the sensor so can they really claim it's 'Four Thirds[/quote] The standard specifies the size of the sensor but does not specify that you must use all of it. The standard specifies the size of the sensor but does not specify that you must use all of it. Panasonic have a nasty habit of restricting flash capabilities, are there any hidden restrictions using flash ie will it allow flash at all shutter speeds and still work flawlessly with any none dedicated units. In respect of flash is this LX100 right up there with the Fuji x100`s and its later versions for creative use. Also your WB test chart is under exposed by more than a stop, I`ve been seeing this a lot and its not doing the camera any justice. Panasonic have a nasty habit of restricting flash capabilities, are there any hidden restrictions using flash ie will it allow flash at all shutter speeds and still work flawlessly with any none dedicated units. In respect of flash is this LX100 right up there with the Fuji x100`s and its later versions for creative use. Also your WB test chart is under exposed by more than a stop, I`ve been seeing this a lot and its not doing the camera any justice. A serious con is that recording in 4K is restricted to 15 minutes, and then the sensor has to cool down before a new recording! This pretty much excludes this camera for any professional or semi-professional use. In 4K the zoom range is about 29-90mm (35mm eq.). [b]This pretty much excludes this camera for any professional or semi-professional use[/b] Nah its the complete opposite Amateurs will shot until the batteries go flat. Professionals tend to shoot in short takes, generally a lot less than 15 minutes, a 15 minute restriction should not cause to many problems. Amateurs will shot until the batteries go flat. Professionals tend to shoot in short takes, generally a lot less than 15 minutes, a 15 minute restriction should not cause to many problems. 15 minutes is more of a serious limitation for amateur use - I don't think iv ever seen a professionally shot film where one viewpoint sequence lasted anywhere near 15 minutes. Mind you it would be unusual for professionally shot footage not to have separately miked soundtrack. No articulating screen so not on my shopping list. @Peadingle - they are probably saving that feature for the mkii version, like Sony did with the RX100. I have Adobe CS6 and it apparently does not yet support the LX100 RAW files. Is there some other software I can use to open them? I have this camera and so far I am impressed. The external controls make setting up manual exposures so quick and so easy. Takes the same battery as my GX7 but the battery lasts longer. For travel photography when you are on a schedule or with non photographers it is ideal. 12.8mp? A LARGE M4/3 sensor? 24-75mm? Still, people will buy it. The only decent thing I see about this is the price, although one could pick up a used DSLR and lens that would greatly outperform this toy in IQ. [quote]12.8mp? A LARGE M4/3 sensor? 24-75mm? Still, people will buy it. The only decent thing I see about this is the price, although one could pick up a used DSLR and lens that would greatly outperform this toy in IQ.Tongue[/quote] You really can't be as stupid as your comment makes you sound. A DSLR with an equivalent lens would be way larger and heavier than the LX100. There is no other camera that combines such a large sensor, such a beautiful zoom lens, and so many high-end features into such a small package. Throw in the excellent manual controls, and you have the perfect compact camera for when a serious photographer doesn't feel like lugging a big DSLR and lens(es). You really can't be as stupid as your comment makes you sound. A DSLR with an equivalent lens would be way larger and heavier than the LX100. There is no other camera that combines such a large sensor, such a beautiful zoom lens, and so many high-end features into such a small package. Throw in the excellent manual controls, and you have the perfect compact camera for when a serious photographer doesn't feel like lugging a big DSLR and lens(es). I owned and sold it recently. Actually it is a decent camera, the only thing that didn't suit my photo habit is its electric zoom which is rather slow. If they come out with the Mark II version that has manual zoom, I will buy it again. The base ISO is ISO200 not 100. The Panny 16Mp FT sensor, it has a base ISO of ISO200. There will a significant loss in DR at 100.